from 12th to 17th of September at Niizawa Brewery, Miyagi prefecture. and Timothy Sullivan of Urban Sake from NYC, USA did all the shooting, directing and editing. Suisen Brewery of Rikuzentakata-city, Iwate. Please stay your attention to their upcoming report! French Michelin chef Pierre Gagnaire and designer / restauranteur Mourad Mazouz created. This building is divided into Parlor, Gallery Room, and Lecture Room & Library. and took me upstairs. I'd never been welcomed like this in London before. This space is like a forever-dream of all girls. The front is "seaweed butter". Saltiness and umami from seaweed was wonderful. At the end of the meal, Pierre Gagnaire himself came to each table to greet. as myself coming from restaurant industry. From now on, it is "after" the event edition. 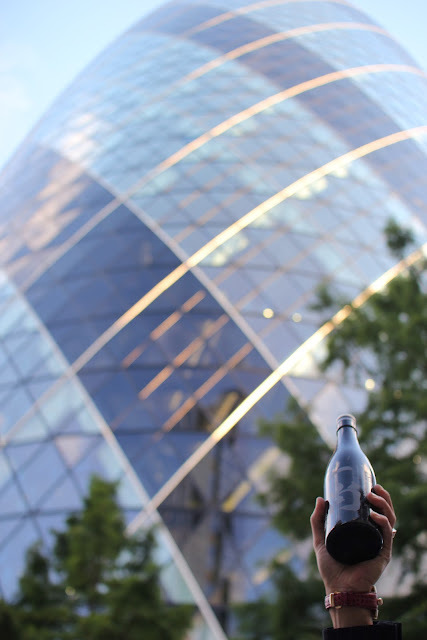 for memorial, Issho Shochu (with Mr. Komaki's hand) and Gherkin building. Mr. Hisanori Komaki of Komaki Jozo from Kagoshima started taking photos of everyone. he captured amazing photos of everyone. President Koichi Hasegawa of Hasegawa Saketen. and you know what, he will be running at Honolulu Marathon next year. With drinking a tons of Sake, please stay healthy and young! I am looking forward to your next visit to London. President Junichiro Aihara and his college student son of Ugo no Tsuki, Hiroshima. and everyone at the events in London loved it. Shy and young gentleman, please sell Sake like your father does! Mr. Takaaki Yotsuya of Yotsuya Shuzo in Ooita prefecture. that is one of the most popular barley Shochu today. Master Sake brewer and Director Mr. Tadatsugu Inoue of Mii no Kotobuki in Fukuoka. who was impressed with its Hojobiden at my restaurant. yet I personally believe that it will be an age of "Yamahai" & "Kimoto" soon. President Yoichiro Umetsu of Yonetsuru Shuzo, Yamagata prefecture. Yet they are different from anything else. Sake like Yonetsuru sells well in foreign countries. Ms. Iida, Dassai European Sales Repsentitive of Asahi Shuzo, Yamaguchi. and very elegant, yet frank and boyish Ms. Iida. this great pair supports the European market of Dassai Sake. Iida san, see you in Paris next week! Asami san of World Sake Import. 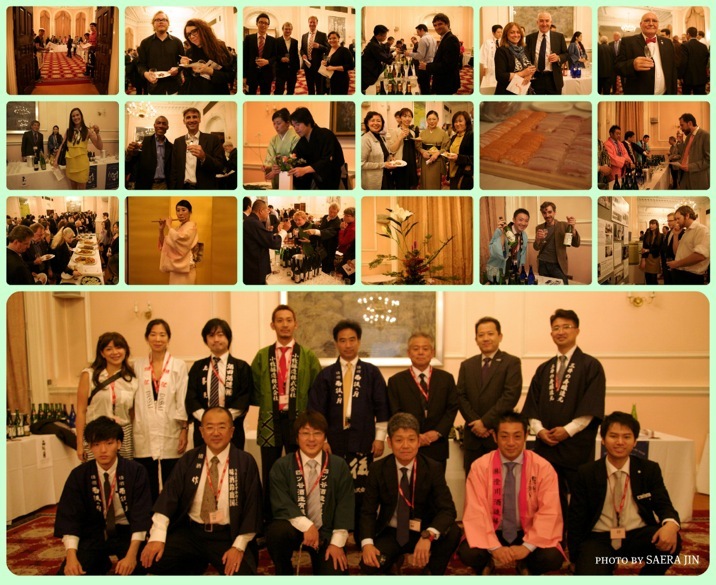 She is one of the important figures to support Sake market in UK. I respect her like a nice sister. Afterwards, the left 5 of us went to a bar at Langham Hotel. Mr. Komazawa san who is not on the photo unfortunately. does not exist without him. he was a bar manager at Hasegawa Saketen GrandSta branch. I am very happy that we got to work together again in London. it almost like having more fathers and brothers in my family. I will introduce all the Sake & Shochu of you all here in London!